Last week I wrote an article entitled "USF1 - The case for" for Keith Collantine's F1 Fanatic. One of the comments took me to task because I had not really written the case for but had produced a rebuttal to a previous F1 Fanatic article by Peter Anderson, "USF1 - The case against". The commenter, Patrickl, was quite right; it had indeed been my intent to answer the first article's criticisms and I mischievously suggested that he read my blog to find out more about the case for USF1. Having said that, I feel duty-bound to go into more detail on the team as I am a recent convert and my previous posts have only touched the surface of what is being attempted. This paragraph is in the nature of being an apology for returning yet again to the subject of USF1, therefore, but it may be appropriate enough since my readers must be thoroughly fed up with reading about the Honda saga and the only other thing happening, the Jerez test, would be better written about once it has finished. And so, to work. The big question mark hanging over any projected new F1 team is the matter of financing; without the necessary money being found, all speculation on engines, facilities, logistics and drivers are just dreams. So it is what Ken Anderson and Peter Windsor had to say about funding that is the most interesting part of the official announcement of the project. And funding means advertising money. To understand what the team principals are saying about funding, it is necessary to look at the way NASCAR does it. Like F1, NASCAR teams tend to have one major sponsor and are often known by that advertiser's name; in addition, however, they have a host of smaller contributors and these are usually given a little space in a jumble of other names on the car. Take a look at the photo above and you will see the horde of logos clustered generally around the front wheelwell. Each of those logos represents some funding injected into the team - but why do the advertisers do it when their name is so small and buried in a confusing riot of other names, rendering it effectively illegible to racegoers and TV audience? I have always maintained that the point of advertising is to get the name known amongst potential buyers; a TV ad may entertain, amuse or startle but, if it does not at some point hammer the product's name into the audience's heads, it is a waste of money. So what are the NASCAR advertisers doing when they clutter up what would otherwise be a clean and tasteful color scheme with their myriad of unreadable logos? The answer lies in the still photos of the cars that fans will pore over before, after and during the season. In close-ups the logos become readable and the investment begins to pay off - the name is being seen and the inevitable connection with motor racing made. What the USF1 principals have noticed is that F1 fans are fed an even more prolific diet of close-ups of the cars. Since every car is different and we want to know about the latest tweaks to a sidepod or wing, we demand pictures of the relevant area on the car as well as an overall view. And in these lies the smaller advertiser's opportunity. 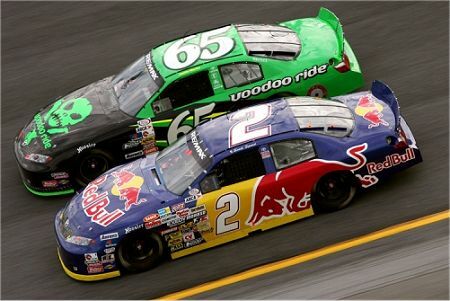 When it comes to major sponsors of the NASCAR teams, we find that the vast majority have no connection with the motor industry; we can see energy drinks, supermarket chains, financial institutions, breakfast cereals, you name it, but nothing actually connected with racing itself. The reason is, of course, that these companies want their names to be associated with the the glamorous and exciting world of motor racing. Just to get the name across is achieving all they want and they pay big money for the prominence of their adverts. If you were able to read the logos in the photo above, however, you would find that most of them belong to component suppliers or racing services companies - they are already connected closely with racing. They do not have the vast budgets of the primary sponsors but are aiming at a less diverse market than are the big companies. The intent is to be noticed by those who are already into cars and racing - they want the enthusiasts, like you or myself. We are the ones who will spend hours inspecting close-up photos of the cars, we are the ones who will notice a tiny logo and be interested enough to google the name to find out what that company makes. And guess what? The next time we need to visit the car parts store to buy new shock absorbers, for instance, we will remember the name and its racing association. Our brand preference has been affected. It is the basic theory of advertising and, no matter how much we deny that we can be influenced, the theory works or the producers would no longer advertise. And the small advertisers in NASCAR are actually targeting their ads more effectively than the big guys. Since the big company names are already well known, they are hoping only that the association with motor sport might persuade a few that somehow this makes them better than the others. The component makers are not so famous, however, and aim their advertising directly at those who are most likely to be in the market for motoring bits and pieces. It comes cheap and hits home - what more could be asked? Ken Anderson and Peter Windsor have looked at the possibilities and concluded, with us, that it is highly unlikely that they will be able to win a major sponsor from outside the sport in such straitened economic times. They propose, instead, to find the necassary funding by totting up the contributions of a myriad of the companies that will supply them with components. They cannot find someone to give them $100 million so they will persuade say twenty suppliers to each let them have $5 million. I believe this could be an extremely attractive proposition to American component companies. They have hit the good ole boys of NASCAR for years and know the effectiveness of having their names on the cars. Now suddenly they have the opportunity to become known internationally and to start selling their wares outside the States. As was pointed out in the USF1 announcement, UPS and FedEx have made delivery worldwide a commonplace thing - for such transportable objects as car components, delivery distance means nothing anymore. F1 also has a mystique felt even amongst the NASCAR fraternity. For a shock absorber manufacturer to be able to say that their products are used in F1 will be a big selling point everywhere. It is a huge marketing opportunity that will be recognized even now, when money is tight. When USF1 was first rumored, I thought it was an impossible dream. From my F1-centric thinking, it appeared out of the question that the necessary funding could be found - and, without the money, it doesn't happen. But Peter and Ken have shown me that it is not only possible but quite likely that the funds can be gathered together from many sources. They have a new concept that might well influence the way F1 teams go about financing in the future. It may not work - it remains to be seen how effective Ken and Peter are in enthusing American investors. But we would be fools to dismiss their attempt merely because it has not been done before. The proof of the pudding is in the eating and I, for one, am looking forward to a hearty meal in the 2010 season. If this succeeds the brain trust of Ecclestone and Mosley are going to want to put bodywork on the F1s. Interestingly enough those who survive recessions best are generally those who diversify their investments. Let's hope it works for sponsors too, in this case. I think the trick would be to get Pepsi in on this. Then, not too far behind there would be another American team with, Coca Cola on the side!! My worry about USF1 is the trust they put in Mosley's capability of making credible budget cuts. With them looking at a theoretical bar from below and trying to reach it while the rest are coming from above leaves the job of defining the bar's placement and application as crucial to USF1 having any success at all. Since Mosley isn't particularly enthralled with doing the right, moral or ethical thing, USF1 may be in for some nasty surprises. I believe the stickers around the front fenders are actually for the contingency awards in NASCAR. There seems to be a real mish mash of these for every event and in order to claim one (or more) you need the sticker. Also some stickers are NASCAR mandates, e.g. Goodyear. Regardless, they all mean money to the team. But I very much agree the ability to "sell" a fender or hood or whatever is key. There was an article a few years ago that went through the vehicle placement and sample pricing, but I have been unable to find it. I would expect USF1 to have a few major sponsors as well as the numerous small ads. If they can pull off the small ad only approach there should be one major cost saving resulting from it. If a team has major sponsors they expect their top people and guests to be given 5 star treatment at all events. In additon to the cost of flights/hotels etc there is the need to provide 5 star facilities at the track and to hire people to look after the sponsor. If sponsors only have small ads they don't expect the schmoozing. That could represent quite saving and therefore less sponsorship to cover that cost. The international side of Pepsi has already been involved in F1 sponsorship, actually. The Jordan team's first major sponsor was 7Up, a brand that is marketed elsewhere than in the States by the Pepsi Corp - at home the product comes under the wing of the Dr Pepper group. That may explain why Coca-Cola was never enticed into competing in the field - Pepsi was hitting the international market, a market where Coke's lead is huge and its manufacturers hardly need to worry. But I agree that it would be great if Pepsi could be persuaded to sponsor the USF1 cars. It just seems to me that, in the present economic climate, they are unlikely to take on such a venture and that is why the team will be looking at many smaller sponsors instead. I agree that it is foolish to trust the announced aims of Max Mosley for the future; he might easily continue his cost-cutting measures as expected but introduce some allegedly "green" measures that effectively negate the reduction in costs. But USF1 has prepared for such an eventuality as much as it is possible for any team to do so - they intend to prove that it is possible to field an F1 team with as small a bankroll as around $100 million. If they are successful in achieving this, I do not think that any failures on Mosley's part to continue to reduce costs will have a great deal of effect on the team. Like everything else, it remains to be seen whether USF1 can do what they intend and become a regular member of the F1 club. But at least they have a strategy and that surely is better than just sitting back and repeating over and over that it cannot be done. I wouldn't bet against them realizing the dream. Pat: I learn something new every day - thank you! It seems that USF1 has been even more innovative than I suspected, however, in that they have seen the possibilities inherent in the NASCAR practice of covering the car with stickers. If the space does not have to be taken up with contingency award stickers, there is no reason why it should not be filled with ads instead. Steven: Good point and I am sure that the team principals will be flexible enough on the matter to accept whatever is offered. Some advertisers might get involved to the tune of $20 million while others may be unable to contribute more than a million or so. Presumably, the size and placing of the ad will be in accordance with each contribution. The team has already said that they will save money by not having many of the supposedly-necessary additions to the modern F1 team - such as glittering transporters and huge corporate junkets (tents have been jokingly mentioned). So the savings possible in that area have been realised and the team has plans to show that it can be done. Personally, I have always regarded the money spent on entertaining the sponsors as wasted. The sponsor has bought advertising space and that is all he should expect in return. Sure, give the blighters some complimentary tickets for their staff but that should be the limit! I think nothing could be better for the survival of teams than having a diversified sponsor base. It would remove the "lights on" or "lights off" effect of big sponsorship. That being said, it is unfair to hang the success or failure of USF1 on the success of their diversified sponsorship (or vice-versa). There are so many factors that go into the success of a team (the least of which are logistics, the location of team headquarters, or the source of funding). The results come from innovation, organization, and the ability of the management to inspire a sense of teamwork (just look at the reaction Honda got when it picked up Ross Brawn). I understand that having a big war chest is an integral part of success in F1, but it is how you use it that counts (again, I call on Honda as an example). It will be interesting to see who USF1 hires for key positions. Currently, I don't think we know enough about USF1 management to make any predictions. Ultimately keeping one's funding hinges on the ability to instill confidence via expected results. If the team sells sponsors on the idea that they are going to have podiums in their first year, they will be fighting to keep those sponsors if they don't deliver. All true, Marc, and I'm sure we will learn more of the personnel taken on as time marches on. For the moment, however, funding must be the prime objective to ensure that everything else is possible. I don't see the team principals as selling potential sponsors wild tales of results in the first year. They have to be realistic in their sales pitch and so will concentrate on the additional marketing opportunities available through the team's existence. And their likely sponsors will be used to this - in NASCAR they will have seen that podiums are rare for any team other than the top few. If USF1 can enter the sport with the percevied scrappy underdog image that Super Good Friends had, I think it would help the team in its marketing efforts tremendously. Tents instead of a multi-millon dollar hospitality center? How cool...and true to that image. America has always been a pushover for underdogs. It would be in the teams interest to build on that specific perception. Agreed, Don. And, let's face it, any team new to F1 is an underdog. Another button that USF1 has to push. I'll bet there will be a bunch being laid off from NASA pretty soon. There might be somebody useful there who hasn't been spoiled by F1's hefty salaries. Clive, good points you make. However, the NASCAR-type weel-well setup is not new to F1. For years, several teams have had smaller sponsors appear on the lower part of the sidepods with often two-tone stickers. E.g. I distinctly remember Ferrari having SKF et al in white text on bare (black) carbon fibre. However, this is only a small portion of the car. Williams used to have several smaller sponsors during the late 80s, early 90s, hence their yellow-blue-white colours scheme, which represented Barclay/Camel, Labatt/Sega, and Canon respectively. Nick: True, NASCAR is not exempt from the economic downturn and there will be good people from there looking for jobs. Lustigson: That is certainly true - Ferrari in particular have a habit of consigning their minor sponsors to one particular area of the car. Even before the advent of sponsorship, F1 cars would put stickers on the cars representing their suppliers of components. But USF1's concept is slightly different in that they do not envisage having one or two major sponsors. So their hoped-for horde of small sponsors will be allocated different areas of the car (I would guess). They could even sell advertising space specific to each part of the car - the rear wing being more expensive than the sidepod, for instance. Further to Pat's note about the "wheel well" sponsors - these are so-called "contingency sponsors," with payouts to teams contingent on performance. Contingency sponsors actually cut a deal with NASCAR, not the teams. NASCAR provides the decals to the teams, as well as a map showing exactly where each sponsor decal must be placed. The teams are required by NASCAR to use the decals - it is not optional. This NASCAR-mandated sponsorship model is common to all NASCAR-sanctioned racing series, all the way down to your local Saturday night short-track bullring. Still looking to NASCAR, many teams have short-term sponsorship arrangements, sometimes for only a single race, and it is common to seem a team's livery change completely from race to race. This would seem to be a very useful model for USF1 - enabling new sponsors to try out F1 sponsorship for a relatively small investment. As Marc points out, a benefit of having a relatively large number of smaller sponsors is that the team is far less vulnerable to the withdrawal of an individual sponsor. Clive, while F1-style corporate hospitality may be well over the top, I don't think we should discount the importance of this component of the sponsor's return on investment. Business to business relationships are nurtured and developed in this sort of environment, and this is especially important for companies that do most of their business selling to other companies - which is the case for many high-tech firms. I share the belief of Anderson and Windsor that USF1 can take a clean sheet of paper approach to build a competitive F1 team for a fraction of the cost of "traditional" F1 teams. For another US example, we can look to SpaceX (http://www.spacex.com), a startup company based on the Silicon Valley business model that is designing and building its own rockets - launching satellites for a small fraction of the cost of competing services offered by the big aerospace firms. Stu: As usual, NASCAR turns out to be much more complicated than I had imagined. Thanks for the explanation regarding contingency sponsors. That is something F1 needs to think about as a whole, although how effective the FIA would be in attracting such sponsors is debatable! Short term sponsors could well be part of USF1's strategy, although they would have to be careful about changing the color scheme from race to race - the FIA is fairly strict about such things. It should not be a problem with small sponsors, however. Bright and enthusiastic people can always think of better and more cost effective ways of doing things and there is no reason why Anderson and Windsor cannot do likewise. Their idea seemed crazy to me at first but, on closer inspection, it is quite feasible. As far fetched as it might seem, I did mean NASA. With the economy in a serious dive many programs will be cut leaving rocket scientists looking for work. These people know wind tunnels, fluid dynamics...etc.